Since August 13th I have been sharing photographs and details of our Michigan vacation earlier this month. The purpose of our Michigan vacation was to attend a Vulcan Riders and Owners Club (VROC) motorcycle rally that was held at Cycle-Moore Campground in Interlochen, which is located in the northwestern portion of Michigan’s Lower Peninsula. Day 1 of our vacation was a travel day. We drove approximately 211 miles from Warren, Pennsylvania, to Norwalk, Ohio. On Day 2 we drove from Norwalk, Ohio, to Interlochen, Michigan where we met up with our VROC friends. We spent Day 3 with our VROC friends: hanging around at the campground, on a sightseeing motorcycle ride, and around the campfire. On Day 4 Bob and I rode to Leland and explored historic Fishtown. Our last two vacation days were travel days. We departed our cabin in Honor, Michigan, on August 11th at 8:00 AM. We stopped for breakfast at Da Dawg House Restaurant in Cadillac, Michigan. As we pulled into the parking lot we saw our VROC friends Tim R. and Mike K.. The four of us ate breakfast together. right before continuing on our way home. I had to laugh when we ran into Mike one more time during our travels. 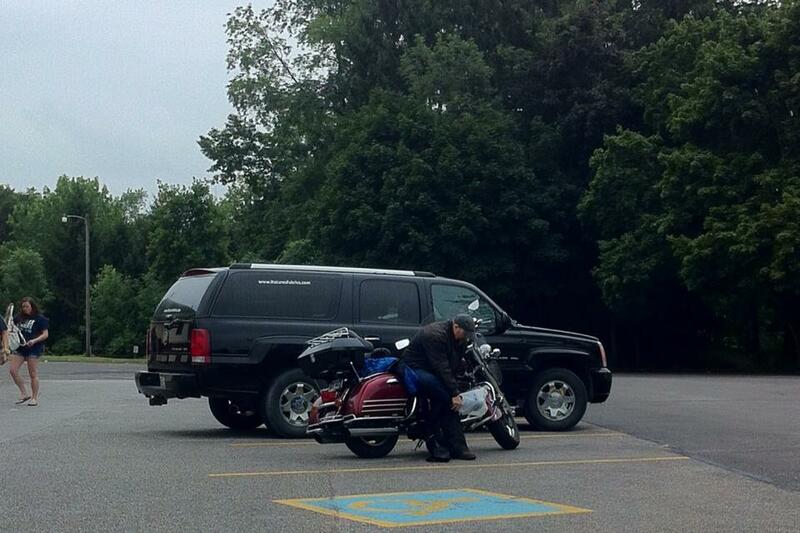 We were at a rest stop on Route 127 near Lansing, Michigan. Bob and I were sitting at a table drinking water. I look up and here comes Mike walking towards us. We had a mishap while traveling today. My muffler fell off, while traveling on I-96. Bob said “it was a lot of fun pulling the muffler the rest of the way off on I-96 with all the high speed traffic whizzing by toward Detroit.” Fortunately Bob was able to get the muffler off with little effort and throw it in the trunk. Bob says he doesn’t “have a problem riding the bike down the interstate at 70 or 80 mph with other traffic, but stopped on the roadside yanking a muffler off a car with that same 70 or 80 mph traffic passing by makes me feel like trouble waiting to happen”. Thankfully trouble didn’t find us! We made it to Best Western Norwalk in Ohio, where we had spent the first night of our vacation, around 4:00 PM. We ate dinner at a nearby Bob Evans Restaurant and spent rest of the evening relaxing in our room. We departed Norwalk, Ohio, after breakfast at our hotel, at 8:00 AM the next day. We ended up going on I-90 around Cleveland, rather than going south of the city as intended. It was my mistake. I made a wrong turn. Thankfully the traffic wasn’t bad and it wasn’t raining. It did start to rain in Edinboro, Pennsylvania. We stopped for lunch at Perkins Restaurant. When we left Perkins it was raining. Bob put on his rain gear. We made it home by 1:30 PM. We had a wonderful time at the VROC Interlochen motorcycle rally. We made new friends and became reacquainted with friends whom we made at past rallies. We need to seriously think about purchasing a toy hauler, though. I drove 1,228 miles during this trip. Bob put even more miles on the motorcycle, as we rode the bike primarily once we arrived at the rally headquarters. I can’t ride long distances and 1,228 miles of driving by myself isn’t fun! You all losing your muffler reminds me of a story I had when I was about 16 yrs old and driving our 1955 Olds in my hometown… I kept hearing a clicking sound under the car. I told Daddy that something was wrong –but he said there was nothing wrong so I was not to worry!!!! HA…. A couple of days later, when I was driving, the drive shaft fell out of that car… And if you know anything about drive shafts, you cannot drive at all without one. Glad you all had a great vacation to Michigan. Linda, sounds like a wonderful time at the rally and meeting up with your friends. I enjoyed the photos. The hauler sounds like a great idea. Sounds like it was a great trip but ikwym re driving so far; it is tiring but worth it for all the wonderful memories and the friends you both made. Being members of a club brings it all together so well and i betcha yer gonna do it again next year! I used to enjoy our street rod out of town meets but somehow over the years it has become mostly guys only and not many wives are going anymore. Don’t know if it’s an age thing or par for the course but next month my hubby will be off with the hotrod guys to Seaside, Oregon while i take off with a lady friend to NY * where we’ll get on a cruise ship. Gotta find our own fun now each in different ways. * unless Air Canada goes on strike as they’re threatening to. An excellent series of posts on your vacation. I enjoyed catching up on your blog. Apart from your muffler dropping off it sounded like a great time Linda. I’ve enjoyed reading about your vacation, and have enjoyed every photo. I don’t even like to hear about your muffler in that kind of traffic! There is a stretch of interstate between here and Indianapolis that we just do not get on unless absolutely necessary. Last year there was over 400 accidents in that stretch….and more than one death.